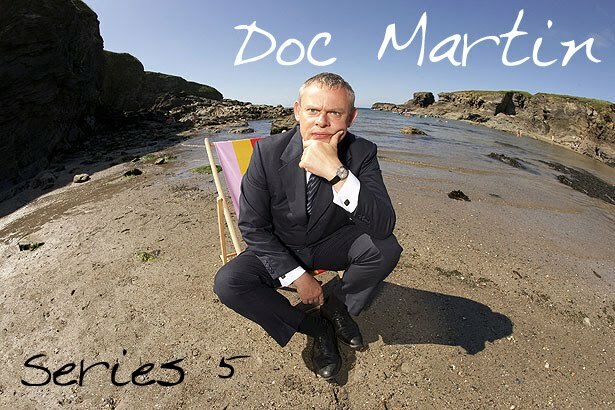 Doc Martin Series 5: Olive Louisa’s Doc Martin Adventure!! 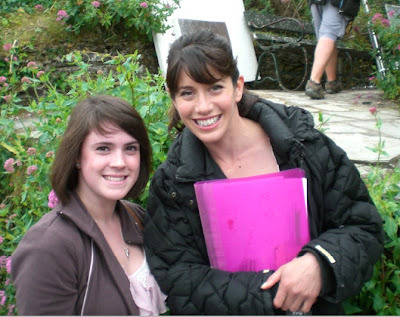 Olive Louisa’s Doc Martin Adventure!! This account contains quite a few spoilers about Series 5!! WARNING!! So, my adventure started at 9am on Sunday 26th June where a 7 hour drive was ahead of us because of a huge delay on the M4/M5 at junction 20! Eventually we arrived at Port Isaac and had a look round about 5pm after checking into our B&B Penrose which is next to the Co-op at the top of the hill near the car park where most people park when they visit for the day so we were so near to walk straight into the village at any time. I was so thankful to have my mum with me, she used to work in Television so together with me we managed to spot signs of the Doc Martin crew and cast where ever we went. Assuming that they would be there on the Monday (as it was the whole reason I went down there) we went down to the front about 9am and looked across to the house used as the exterior for Doc Martin’s surgery to see more people than usual. Mum spotted a boom and camera and I spotted Martin Clunes so we went along to see if we could watch, passing several runners at the bottom of the hill. Louisa: Mum, where are you going? I thought you were staying for dinner? Mum:???? is treating me to Portwenn’s famous fish and chips. Sorry. Martin: (To fisherman) you haven’t made an appointment to see me I need to change your dressing. Fisherman: In a bit of a hurry here Doc, can’t it wait? I stayed and watched this scene for about 2 and half hours, possibly 3!! It took a long time because they needed to do it different shots, close ups on each character, long shots on the couples of characters and the baby kept wiggling!! It did start to rain so some people did leave making more room at the front for me! I looked around and John Marquez had appeared on set (he plays PC Penhale) and they had to film a scene from Episode 7 which needed Martin in pyjamas and so he spend a lot of time being typical Martin Clunes and running about in them! 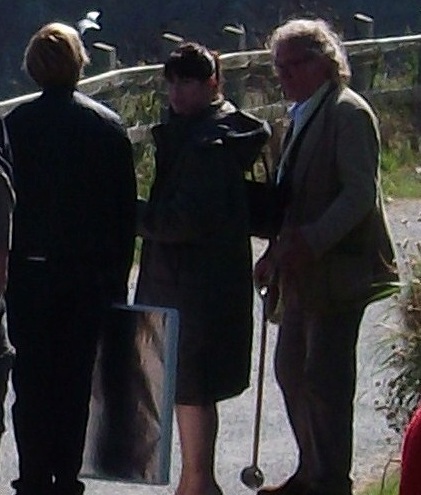 The funniest thing was a woman who was Australian stood next to me thought he was really grumpy in real life and that he hated dogs and people- that being the reason they cast him. I had to explain much to the amusement of nearly everyone around me that he was just acting!! He really liked dogs, often is silly and will sign nearly every piece of paper you thrust in his direction! The scene between Penhale and Martin took just 5 takes which is good considering the last one was so much longer, it was mainly due to the fact there were only 2 of them in the scene! But of course using the baby it started to whinge in the middle of the scene, and then the take afterwards Marquez forgot his lines! Penhale: Oh, Doc, by the way, you might say no but do you fancy going for a drink sometime? Here they told us that they would be bringing an ambulance up to the surgery and that if we could all ‘go away’ for about 20 minutes they would be able to film the next scene and there we broke for lunch! Mum said they would be more like 30/40 minutes what with getting everything up there, retouching makeup and repositioning the camera! We had our lunch/cake and headed back up the hill to admire the somewhat misty view and sat on a wall chatting to some other ‘stalkers’ as mum called us about episodes we liked and what pictures we had got. Suddenly mum shouted ‘look someone with a boom they must be starting again’, I looked and said ‘Who cares about that look its Caroline Catz- my all time favourite actress so I went rushing down the hill to the house before anyone knew what was happening, so got some pretty good shots of her which are on Flickr the link to which is to follow. Louisa’s mum is wheeled out of the door on an ambulance stretcher followed by Martin watching and making remarks under his breath. He steps out his house watching them take her away. Louisa follows shortly after with a baby car seat with the baby in and after a brief conversation with Martin where his line ‘She’s going to be fine’ followed by a solemn nod from Louisa as she walks out of shot. A voice from the door way presumably the new receptionist says ‘Doc, I have PC Penhale on the phone, it’s an emergency’. Martin sighs taking another longing look at Louisa and walks back inside with the door being closed behind him. I assume that the mother being taken off leads into the ambulance scene they filmed earlier but I could be wrong. 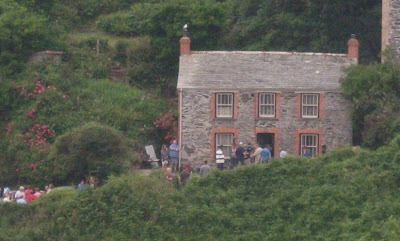 As soon as they said cut and everything, the assembled mass of about 25/30 people swiftly moved up the hill towards the actors- mainly Martin Clunes! I had already had my photo with him and wanted one with Caroline so much!! She was talking to another member of the crew in her warms jacket and ugg boots, she also had a script in her hand and was facing the other way so most people dismissed her as a crew member but I recognised her!! After mum interrupted her I asked for a photo she said ‘yes of course you can’ smiling! I asked if she wanted me to come up or what she said ‘no don’t worry I will come down to you poppet because we are going that way afterwards anyway’. She asked how I was and I did the same and we had our photo!! Again it had rained more since I had my photo with Martin but it still to me is the best picture ever!! After we had had a few pictures, which this was the best as she had a tendency to blink in the others! She said ‘well it was really lovely to meet you’ and walked down the hill in front of me talking to the crew member we had interrupted her conversation with before. When she got to the car she turned round knowing I was behind her, and waved to me! It had made my first day at Port Isaac (or should I say Portwenn as it said outside the pottery and the fact Bert’s Large Restaurant sign was up) an amazing one!! After chatting to the runners from Monday we knew that we wouldn’t be seeing the crew or cast on Tuesday because they would be in the studio all day filming on Martin’s interior house set, they said something about his kitchen so we will have to eagerly await that scene when it the series is aired!! I found out from one of the nicer runners the first episode is aired on 12th September 2011 so I hope you are all now counting down to that! Mum and I were planning to walk to Port Gaverne then back along the cliff path into Port Isaac to do a little bit of shopping when Mum spotted a small orange arrow with the letters LOC on. 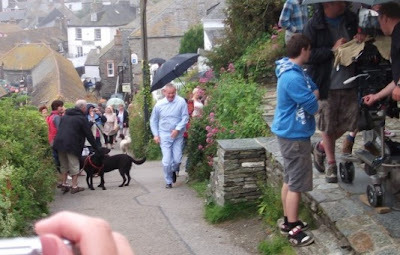 Immediately we both knew they were filming, coupled with the fact we saw the ‘Camel’ hire vans which the Doc Martin crew had been using all the times we saw them. As soon as we walked around the corner we saw the runner we had been talking too yesterday and she stopped to talk to us. 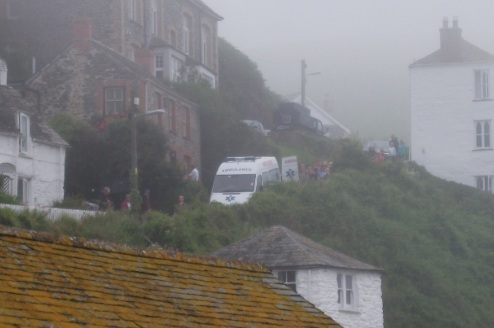 It turns out the cliff path scene they were planning to film yesterday wasn’t achieved after we met Caroline because the mist was coming in. This morning was ideal as it was so sunny and lovely, yet everyone was still in their warm coats. I looked up while she was talking and saw Caroline dead ahead of me! I felt like the luckiest person in the world to have seen her two days in a row. The best thing was as we got closer she turned round, remembered what I looked like and smiled at me as we walked past them. The scene they were filming was Louisa and her mother walking along the cliff path pushing the pushchair, but we didn’t have time to ask what episode as we were rushed out of there pretty quickly, still it was lovely to see her and that she recognised me. We walked home the way we came to see if they were still there but unfortunately they weren’t, so we had a nice day out doing lots of walking and visiting famous places! I had heard that Caroline and a lot of the other Doc Martin crew were staying in a near by B&B and had eaten down at The Mote on the harbour so persuaded Mum to let us eat there but we unfortunately didn’t bump into them again… was a great start to the day seeing Caroline in the morning though!!!! From information we had collected from before- we had been more organised at collecting information than we thought on the Monday even with the excitement of meeting Caroline and Martin! Mum and I were told they were filming on The Platt which is the harbour area where a lot of the boats and lobster pots are above the beach in the morning until about 10. So being insane stalker types me and mum planned to watch in the morning! Obviously because Mum was in the business for years she was aware of early morning protocol and I was determined to get some autographs to go with my pictures with the stars! As insane as this was, we were up and walking down to the harbour at 7.15!! We got down there, to find they were up in the hill- to be fair we spotted them a mile off as it’s the hire vehicles which catch your attention first. Martin runs up the stairs, medical bag in one hand and Moses basket in the other. He placed the basket on the bench and moves towards the large group of runners where one is obviously injured on the floor. It came to 9am in the morning and we had been watching for an hour, but we unfortunately had a really long drive ahead of us so had to leave them but were so lucky considering we got there on Sunday evening and left on Wednesday morning and caught the filming of 5 scenes. As a bonus I met my favourite actress once and saw her in total twice, I met Martin once and watched him from a distance too! I had an amazing week, if you have the chance go down and watch some of the filming- it is such a rewarding experience, but you do have to keep pinching yourself! Thanks so much for posting all of this lovely detail! And I'm thrilled for you that you got such great pics with Martin & Caroline. I live in the States, but I'm a big fan of Martin Clunes, and a HUGE Doc Martin fan, and I've made a convert of my mom and sister. We all wish we could visit Port Isaac, but since we can't, it's wonderful to have generous people like you sharing your experiences with us! Oh, and I think that it's funny, too, that even on the show, they aren't saying what the baby's name is yet & have obviously waited many weeks to name the kid! A nameless baby -- I'd love to know what's going on with that -- maybe problems with "Mum" and what she wants? Can you imagine letting the state name your baby? LOL! Thanks for such a great blog !! And, congratulations on such good pictures. 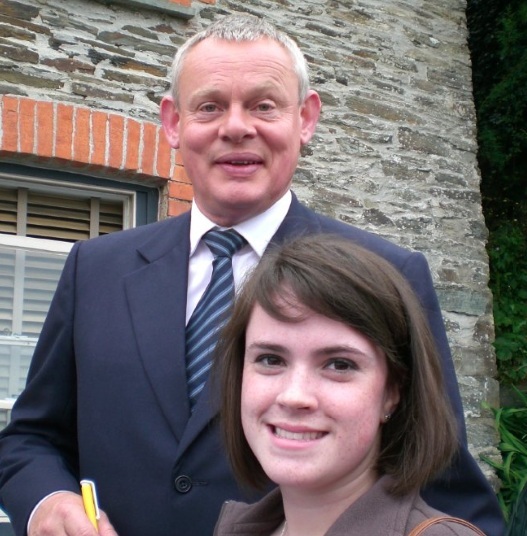 I too live in the States, and love Doc Martin. Can't wait for the new series !! I only just realised there are comments on my blog, I just rediscovered it! Yes my fan videos can be found here: http://www.youtube.com/user/OliveLouisa Only 2 years too late, so so sorry!